The musical lineage of Devin Kennedy’s family is very much the reason why he chose the same path. His grandfather was a concert pianist and his father is a producer and mastering engineer, so it was only fair that he was introduced to multiple instruments at an early age. The Los Angeles-based multi-instrumentalist began teaching himself drums and guitar first, followed by bass and piano - all before his teenage years. By the time his high school years rolled around, he was ready and more than willing to explore the idea of fronting a band which he did for almost five years. Kennedy credits his family as the inspiration behind wanting to continue and grow musically, which is why he attended Berklee College of Music. His time at Berklee led to his evolution of fronting a band to becoming a solo pop artist. His first release, “Love Language”, was the product of over a year of refining what he wanted his sound as a solo artist to represent as well as crafting the message he wanted to send. He learned quite a lot through this release, and took those lessons with him into his latest single, “Bad Habit”. “Bad Habit” is the latest in a string of singles Kennedy has been releasing since April. It was written, produced and mixed by Kennedy and fits the darker, pop vibe he’s been going for. It’s not just a track that he’s hoping listeners will dance to, but a track that will make people more aware of their habits and how they affect the people around them. 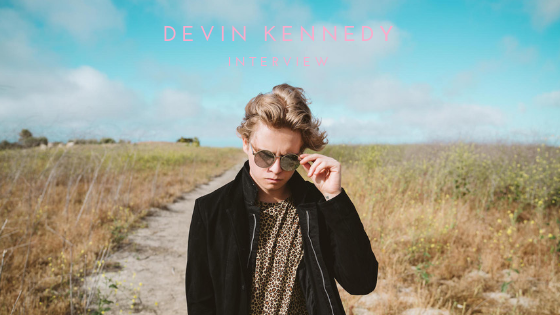 If it wasn’t for Devin Kennedy’s musical upbringing, the world might be seeing a different version of him. As he continues to follow in the footsteps of his father and grandfather, his musical evolution should be equally as fortunate.